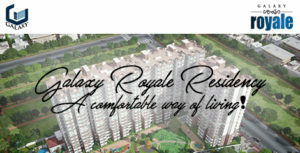 Galaxy Royale Residencies are the ways of comfortable living with luxurious amenities like swimming pool, gym, club, world-class shopping arena, office space, hyper-market, serviced studio apartments, and much more! So, if you really want to enjoy one of the best apartments in the world, then you should visit Galaxy Royale campus, which serves more than desired to everyone. More open area inside and outside! 20% covered area is surrounded by 80 % open space, such that you could really breathe well. Also, the spacious rooms, large windows, and big balconies give extra space to your creative mind. You can explore several possibilities of theme balcony, providing an open, airy space to relax and rejuvenate with touch of healing nature! Galaxy Royale is composed of 2/3 BHK apartments designed to provide special comfort to senior citizens, children, and ladies as well. We care for the residents, who spend most of their time period in the comfort of our apartments. Large children’s park with special rides, big green area with beautiful landscape, and club equipped with Table Tennis, Carom, Card Table as well as Pool Table; are a few other features to relax upon! Nearest Distance from nearby commercial centers of Delhi, Noida, Ghaziabad, Greater Noida, and Faridabad. Also, it is close to the suburb areas of UP like Moradabad, Bulandshahar, Meerut, and many more. Noida City Center Metro Station and Sector-18 Noida Market are only a few kilometers (less than 10 km) away. So, if you are really interested to expand your business and raise your standard of living, then you should book a flat and a shop keeping in mind of both aspects. As soon as you expand your business in an area accommodating 3.5 lac people, your standard of living automatically improves and at that time, you will be very happy to possess the international lifestyle, at affordable cost. New Year Gift for people whom you love the most!